Some time ago I wrote about NOT shooting as an “occupational hazard” of studying gun culture. In 2017, as part of the research for the chapter of my book on the gun training industry, I saw at least 100,000 rounds fired. But shot only about 1,000 rounds myself, max, and 400 of those were one weekend at Rob Pincus’s Combat Focus Shooting Instructor Conference. So, I have a lot of pictures from last year, like the one from Gunsite below, of me watching other people shoot. And as I have explained in an earlier post, I observed instead of participating for good reasons. 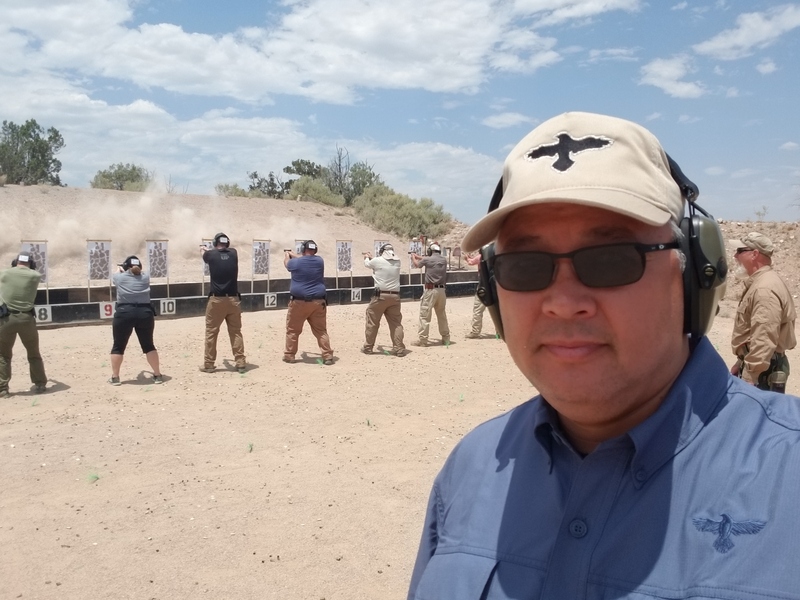 But ongoing conversations with two guiding lights of American gun culture — Kevin Creighton of Misfires and Light Strikes blog fame and USPSA Grand Master Karl Rehn of KR Training — have convinced me to change my ways in 2018. 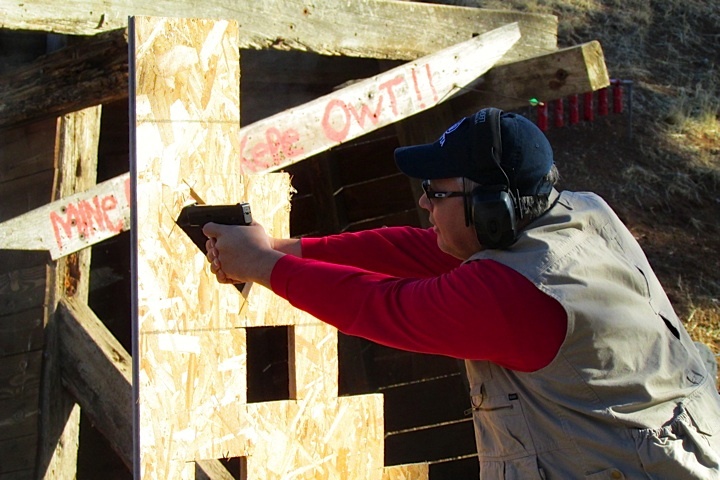 Shooting at an NRA Personal Protection Outside the Home Course, 2013. NOTE: To this end, SPONSORSHIPS ARE WELCOME. Just imagine the picture above, except me shooting your ammo, running your gear, wearing your hat and shirt and patches. Imagine! It isn’t hard to do! In two following posts, I will discuss Kevin’s and Karl’s input, and how I plan to act on it in 2018. Haha! Yes, sponsorships for us all! Maybe in 2018 I’ll keep track of how much I spent on ammo as opposed to merely how many rounds I fired. It adds up fast. Good idea. I am going to keep track of cost myself. Shooting is definitely an expensive hobby. In 2016 I worked as an armed contract security officer. I had to pass a qualification shoot to do that. While I still had the job every payday I bought practice ammo and shot at range south of High Point. It’s not just the ammo. You have travel expense, range fees, targets and cleaning materials. However I did see my shooting improve over the 7 months I had that job and did the shooting practice. I think you’ll do very well re: training. There is always a battle between enthusiastically rushing into the jungle without a compass v. preparing gear, weather charts, reading 27 books about the terrain and never stepping foot on the trail. My Mr.Spockish self is much more prone to the latter! You’ve seen best practices and been exposed to some brilliant trainers whilst having just enough hands-on to be quite familiar with shooting, yet not ingrain bad habits into your subconscious. Your classroom audits and observations of 2.0 ensure the ladder of excellence you’ll be climbing is leaning against the right wall. We all know coworkers who’ve been on the payroll twenty years who in actuality have worked one year…twenty times. That was me for the first ten years of shooting. No guidance, no improvement– just sending nickels and quarters down range with each trigger press. It creatied more work for my future self to re-groove the LP & overwrite the aimless, unfocused mismash of neural pathways I had had lazily laid down in my ignorance. Trying to make Sgt.Pepper our of G.G.Allin is not fun. The time and money saved by having been exposed to the great minds you’ve encountered will be great! Best of luck on the journey this year.